Sometimes filmgoers simply want to be entertained and often don’t mind when the means of that fun skews towards the headier side of things—no matter how implausible, campy, or convenient that direction proves. 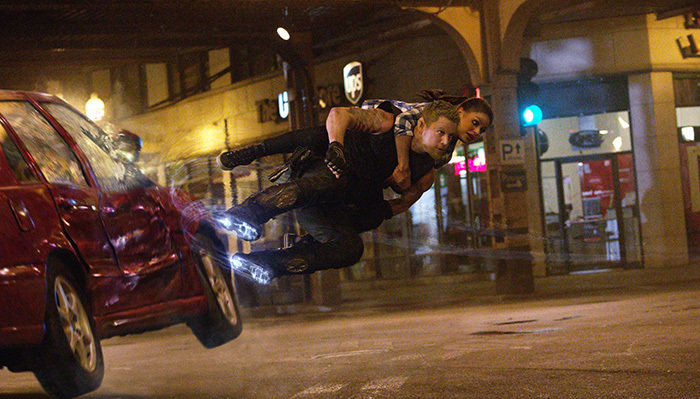 Jupiter Ascending isn’t trying to sell itself as some grand magnum opus with towering ambitions; it’s merely a new space opera from the blockbuster sci-fi duo Wachowski Starship (Andy and Lana). They were commissioned by the studio to write exactly that in the hopes of franchise viability, particularly the sort of story we don’t often see being told on the big screen nowadays. Regardless of if there’s any future here, I’m glad for this single adventure within its world. And while the film does not take itself seriously, it is a serious film. No matter how cheesy the pieces, (Channing Tatum‘s Caine is a genetically spliced human/canine hybrid), or goofy the names, (Mila Kunis‘ Jupiter Jones foreshadowing its planetary plotline), it is not a comedy. You’re meant to laugh at its absurdity and roll your eyes at the homages—there are plenty—but not at the whole. This pleasure enhances the action adventure portion, easing its audience into a comfort zone to bask in the theatrics and yearn for the happily ever after. That’s why its expository notions of gene rejuvenation and galaxy-wide capitalism becomes less talking point commentary and more realistically futuristic issues to progress the story in a relatable manner. The rest is your generic fairy tale rags-to-riches trajectory with nods to Disney’s Cinderella (I thought the bees were going to sew Jupiter a dress) of a poor girl dreaming large because her destiny is unknowingly aligned to the stars. She’s the pawn in a game of power and greed between three siblings who own a highly lucrative stable of planets thanks to the inheritance left by their slain Queen mother. The eldest Balem (Eddie Redmayne) sees the miracle of Jupiter’s genome (the movie will explain) and knows her life threatens his hold on Earth’s coveted natural resource. Sister Kalique (Tuppence Middleton) desires her inclusion to their world to ensure Balem won’t get his way. And Titus (Douglas Booth) connives in the hope he can steal everything. Enter a bunch of bounty hunters (David Ajala, Doona Bae, and Tatum), secretive double-crosses with hidden agendas, and the intergalactic police via Nikki Amuka-Bird‘s captain and Sean Bean‘s forced retiree/banished Legionnaire Stinger. Sounds a bit like Guardians of the Galaxy, right? I’ll admit it’s very similar right down to the chainmail walls of spacecraft needing to be broken through during the climactic battle. It’s not as entertaining as Marvel’s mega-hit—I’m not delusional—but it’s a wholly different beast. Jupiter Ascending doesn’t have a cinematic universe to fall back on to introduce characters or guarantee their return. The Wachowskis must simply forget about a lot of subplots so they can jump from one stone to the next before Jupiter and Balem meet. In this way the film is blemished by its brevity and may appear convoluted because there isn’t time to go in deeper. However, the stellar computer graphics and Wachowski flair on the action front had me quickly ignoring how forks in the road fall away en masse. Yes it lends a somewhat stilted effect to the progression, but I can’t say you could remove one chapter and still find the whole coherent. We need the steady evolution to accept Jupiter’s embracement of an entirely new world laid before her eyes. She must meet Kalique and then Titus to work up to Balem. What she gleans is crucial to her eventual strength. As for the rest: Tatum and Kunis provide an effective romantic chemistry with his half-breed freak and her royal loving each other regardless. Callbacks to films like The Wizard of Oz (tell me the Abrasax trio’s Gatling gun toting guards aren’t flying monkeys), Brazil (complete with a certain cameo), and Soylent Green (the filmmakers go one-step further after Jim Broadbent’s comic declaration in Cloud Atlas) are many, overt, and apt. Fight scenes are exhilarating thanks to a fresh camera rig the Wachowskis created (like they do) making aerial fisticuffs entertain in 360-degrees. And each Abrasax child goes above and beyond the call of duty where villainy is concerned—Booth’s deadpan charm fitting where it risked falling flat in The Riot Club and Redmayne’s reptilian rasp delighting in its overwrought, tear-filled emotionality. Juggling many characters, the lack of Redmayne’s Balem is noticeable. Being the mastermind lording over a universe, he kind of disappears and waits his turn for the spotlight. This gives us more time to get to know Kunis’ Jupiter and understand her everywoman importance, though. She is you and I—a normal human thrust into an extraordinary situation with the fate of Earth resting on her unwitting shoulders. She has a family to think of (one supplying random comic relief much like the periphery visits with people in each of Doctor Who’s companions’ lives) and love in her heart. What would you do if you simultaneously discovered you were both beloved royalty and a member of an insignificant race on a vainly underdeveloped world? 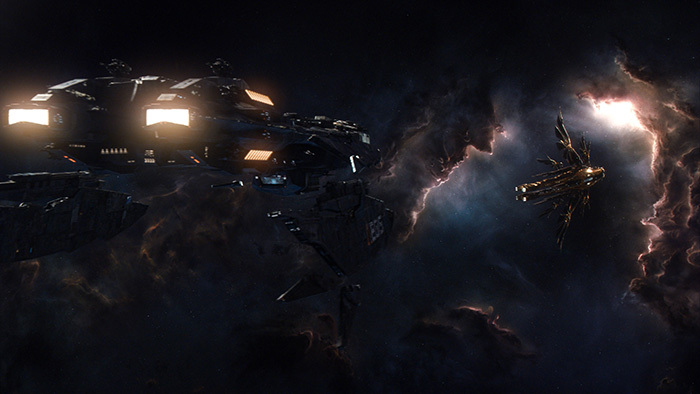 While problematic in sections, Jupiter Ascending delivers on its promise. The film is clearly targeted at college kids who want a little more than disembodied violence a la The Expendables, with quasi-intellectual sci-fi only proving to be a means to an end behind the fantasy artifice. Will it find that audience? I hope so. It might mean coaxing prospective ticket-buyers to attend as with the intent of laughing at the film rather than with, but I believe some of those types will change their tune once they’re caught within it. Jupiter Ascending hits wide release Friday, February 6th.